After a bad break up, doesn't every girl want the same things? * Or maybe emigrate, to a remote, uninhabited island? * Better still, that she'd never met him in the first place! But what if one of those wishes came true? Tess is heartbroken when Seb breaks up with her and can't help blaming herself. If only she'd done things differently. If only she could make right all her regrets... But she can't. It's over. She has to forget about him. Drunk and upset on New Year's Eve she wishes she'd never met him. What I love about Alexandra Potter’s books is the way they deal with magic and mystery. It’s like she has taken fairytale qualities such as wishes coming true, wicked witches and fairy godmothers and applied them to modern romantic fiction! She has not failed to impress in her latest offering. 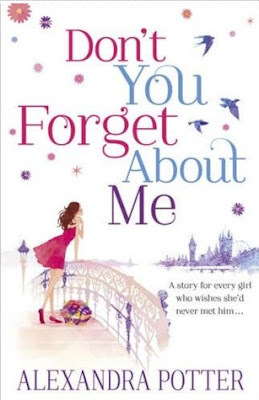 Don’t You Forget About Me centres around Tess and a wish she makes at New Year which appears to have come true. Tess is a great character because she is entirely relatable. She’s not entirely happy in her work life, her love life has just taken a turn for the worse and she doesn’t seem top entirely know what she wants, elements of which most of us can identify with. Flat mate Fiona, Ex-boyfriend Seb and new friend Fergus are also the kind of people we might recognise from our own lives. I read this book in one sitting because the storyline was so easy to get into and as I have mentioned, the characters were so simple to get along with. She gets right into the action, and we find out what is going on with Tess straight away, meeting her on new years sitting at her desk, mourning the loss of her most recent relationship. The story then progresses quickly from mishap to disaster with heart-warming moments and laughs along the way. I think that because the characters are so easy to identify with and the magic of the story provides real escapism from our own real life dramas, anyone would find this book easy to love. For anyone who is a fan of Alexandra Potter’s previous novels, this lives up to its predecessors magical fun and frolics, and for those who have not yet discovered this author, hopefully this novel will lead you to explore her others for more romance, humour and a little bit of a fairytale ending!